The timeless whisky and soda is not a new concept, but simply adding a twist of flavour unleashes a world of refreshing possibilities. Alice Lascelles investigates. High and mighty: a simple drink, but also a twistable classic. In the 12 years that I’ve been writing about hard liquor, there have been a few cocktails that have really, fundamentally, changed the way I think about drinks. They include the Martini, the Negroni, the Sazerac and the Manhattan, classics that have taught me all sorts of things about the ways flavour works, and how it can be tinkered with (which is probably one of the reasons they’re classics – they never get boring). More recently, that list has also been expanded to include the Whisky Highball, a deliciously understated aperitif that’s now emerging as the hip new bar call among whisky lovers from Tokyo to Manhattan. Of course, the idea of mixing whisky and soda is nothing new – my grandfather drank a Scotch and soda before lunch every day of his life (always in a tweed three-piece suit, regardless of the weather). What makes things different this time around is this whisky and soda’s got bells on – beautiful ice, elegant glassware and an aromatic citrus twist, or a verdant sprig of mint, that makes the flavours of the whisky absolutely pop. It’s refreshing, delicate and dry, but it’s got subtle complexity too. If the Manhattan is the oil painting of the cocktail world, then the Highball is the prize-winning watercolour. The place that taught me to love the Highball was Tokyo, a city where people are commendably un-squeamish about adding water to their whisky. Particularly during the steamy summer months, you’ll find everyone from trendy bar-goers to business men in high-end restaurants in this city drinking their whisky with a generous dose of still water (a serve known as mizuwari – literally ‘mixed with water’) or topped up with soda to create a thirst-quencher that’s often sipped right the way through a meal. And a Highball can be an excellent match for food, adding just enough sweet, spice and smoke to give everything a little seasoning, but at a strength that doesn’t leave your tastebuds blasted by alcohol. 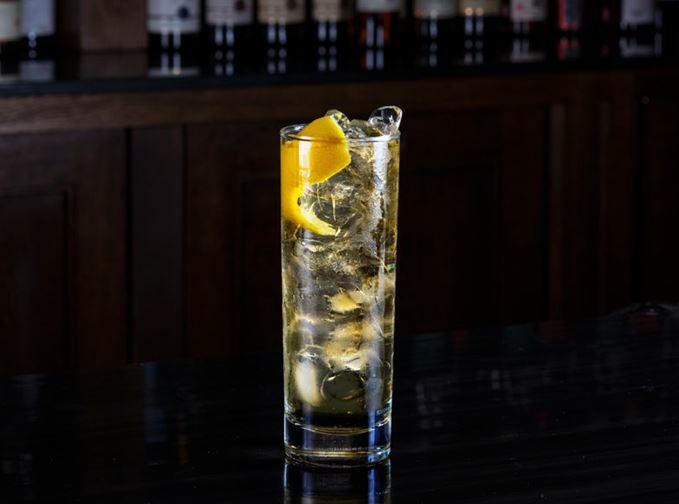 ‘I love highballs for so many reasons – they’re a really refreshing way to drink whisky and also a great match with food, which is why we include them on our food and whisky matching menu. The perfect Highball is a matter of taste, but a good rule of thumb is about one part whisky to three parts water. Lashings of ice and well-chilled soda (plus a tumbler straight from the freezer if you want to be really classy) will also help to distinguish your drink from the tepid sharpeners of yore. Blended whiskies typically make great Highball material – some favourites of mine include Compass Box’s Great King Street Artists Blend, with its toasty ginger nut and vanilla notes, and Cutty Sark, which offers more crisp apple and crystallised citrus flavours. But single malts can work beautifully in a Highball too. Glenlivet Founder’s Reserve, with its generous, buttery fudge and orchard fruit, makes a lovely counterpart to the attack of slightly saline fizz. And peaty whiskies can work well too – try something at the fresher, more grassy end of the smoke spectrum like Caol Ila 12yo from Islay. The only types of single malt that really object to being mixed with water are those that are either really elderly or very heavily Sherried – that chewy, tannic structure just falls apart like a sodden Christmas cake. When it comes to the garnish, there is virtually no Highball that doesn’t taste better with a fat citrus twist. Simply take a potato peeler and cut yourself a thumb-size slice of peel, pinch it shiny-side down over the surface of the drink to release the zesty oils, and then drop it into the glass. I tend to find lemon likes more grassy, honeyed whiskies, while the sweeter orange pairs well with more spicy drams. Pink grapefruit loves caramel and vanilla, or you could even try yuzu. I’ve also garnished highballs with smashed lemongrass, apple slices and (as in the case of the recipe below), mint and a little spritz of rosewater. Smoke and roses is a winning combination – but if that’s not your cup of tea, a simple lemon twist will do great service too. To wake the mint up, give it a sharp clap between your palms before adding it to the drink. For the rosewater, you can just use one of those cheap atomisers you get in the chemist – great for adding waters and tinctures to cocktails of all sorts. Method: Combine whisky and soda in an ice-filled glass and garnish with a large mint sprig and a single spritz of rosewater. Method: Add the whisky (and optional vermouth) to an ice filled highball glass, stir gently and garnish with a fat orange twist. Method: Add ingredients to an ice-filled highball glass, stir gently and garnish with a slice of root ginger. Alice Lascelles is the author of Ten Cocktails: The Art of Convivial Drinking (Saltyard 2015).